Since the dawn of time there have been scary games, with zombies and monsters and foreboding music. And I'm sure everyone has experienced fear and is haunted even now by the sounds of time running out in Mario or air running out in Sonic. That's why this list is not about those things. It's about the small things in normally non-frightening games that became horrors to my innocent young mind. So let's get this list started, starting with the most obviously scary to the most unexpectedly scary. That heading is pretty descriptive and easy to understand, but there are two such enemies that remain burned into my mind from my childhood and both are from NES games. 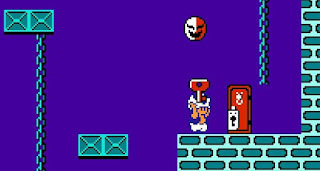 First, there was Phanto in Super Mario Bros. 2, a mask-shaped enemy that would come to life and chase you down as long as you were carrying the key it protected. Even if you went through a door, this thing was relentless and would follow you onto the next screen. The evil grin on Phanto's face scared me enough that I almost always took the warp to World 4 in order to avoid him in 1-3. 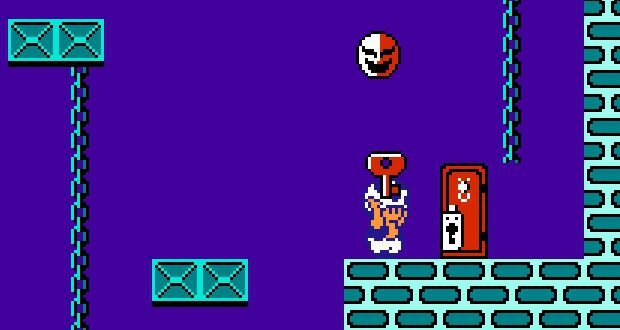 You would think that when the original version, Doki Doki Panic, was remade into a Mario game for the United States, they would have made Phanto a bit less creepy. But no, it was actually the other way around; the original Phanto sprite lacked the evil grin and just looked sad and lonely. Nintendo thought American players weren't ready for the difficulty of the real Super Mario Bros. 2 (later released as The Lost Levels), but at least they thought us ready enough for a more horrific Phanto. The other, was Baron von Blubba, which is apparently a "ghost skeleton beluga whale", but to me it was simply the restless spirit of some creature that wanted me dead for no other reason than that I was taking my time and enjoying the game. But to von Blubba, that meant taking too long to finish a level. The Baron is an impatient son of a blub who despises noobs taking too long in its game. And on that count, who can really blame him? I just wish he could've been a bit more polite about it. The fact that his coming was heralded by the most doom-filled music you've ever heard and coupled with the innate fear of running out of time didn't help either. Honorable mention: the sun in Super Mario Bros. 3. Overall, Super Mario 64 isn't a very scary game, yet from the very beginning I picked up on the eerily quiet atmosphere of Peach's castle, which was mysteriously devoid of any of Mushroom Kingdom's subjects except for an occasional Toad which materialized out of thin air. 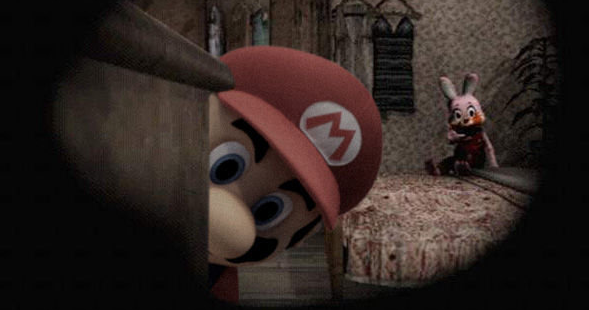 More disturbing, was Bowser's laugh which greeted me upon entering the castle; it was ominous, evil, and its source was unknown. Somehow Bowser was watching me and I didn't like it. Then there was the level known as Big Boo's Haunt. This wasn't the first time that there were ghost levels in Mario games, but for me it was certainly the scariest. The ghosts weren't the scary part; in fact, once I encountered a Boo I found the level was less scary. What freaked me out was the "music", which was like an unnaturally low sound of howling wind. When you first enter the stage, you are outside the haunted mansion and the only music is the howling wind. It's desolate, creepy, and foreboding. Inside the mansion there's some doom-filled piano added to an unearthly droning sound which together set an atmosphere that is altogether more creepy than a Mario game ought to be. If that wasn't enough, there is also a piano enemy, just for this level, which unexpectedly and loudly starts hopping towards you and chomping at you when you pass by it. Compared to all this, the underground carousel, which had its own creepy-in-context carnival music was a relaxing break from the dread-filled atmosphere of the mansion. Keep running. Bowser's laughing at you. 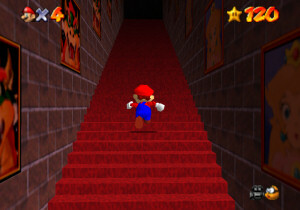 The last thing from Super Mario 64 that creeped me out and sent me seeking comfort from my mommy, is the endless staircase that lead up to the final boss. Throughout the castle there are doors with stars on them which only open if you have the required number of stars collected. In the case of the final star door which leads to Bowser, you need 70 stars, but if you have less the door still opens, leading to a staircase. It looks normal... but then it keeps going and going and going... forever. And once again, that wouldn't be so bad if it didn't have the mysterious music playing as you run hopelessly upward, driving home the point that something is seriously wrong. I didn't know how games were programmed or designed, all I knew was that stairs couldn't go on forever and that when I turned around I found I was only a few yards up the staircase, so something sinister was at work here. Suffice to say, I didn't go back in there till I had the required 70 stars. I think there's a trend already going here of things that scared me being more due to the creepy atmosphere and scary music than due to anything actually frightening. Tourian, the next item on our list, is the last area in the game is the home of the Mother Brain as well as a bunch of metroids. 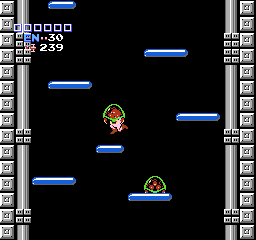 As a kid, I had no idea that to get to this area you normally had to beat two other bosses first, or that metroids could only be defeated by a combination of freeze beam and missiles. So this is why, when I came to this area, always by using a code, I found myself completely unprepared. They want to hug you to death. Up until this point, all the areas in the game had been colorful and had pretty catchy, albeit slightly mysterious sounding music. Stepping into the gray and robotic-looking Tourian, with its comparatively dark and foreboding music was a bit of a shock. After that, it didn't take long before I encountered the metroids, which were, to me, unbeatable. Before I could say "screw attack", those metroids were on my head and draining my energy faster than a WoW addict drains a Mountain Dew. Like the endless stairs of Mario 64, something about Tourian just felt scary and wrong to me and I wanted no part in exploring it. Creepy atmospheres designed into a game are one thing, but when the game itself started doing something it's not supposed to, my uneducated mind considered it just a small step away from supernatural. 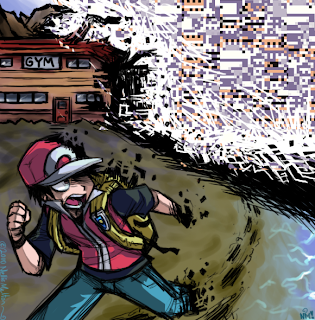 Early on, one of my friends told me that if you talked to the old man in Viridian City, then flew to Cinnabar Island and surfed up and down the side, you could encounter the glitch Pokemon Missingno., which would also give you 128 of the sixth item in your bag. Of course, who didn't want to have unlimited master balls and rare candies? But this good fortune came at a price; no one seemed to know exactly what other side effects might happen due to seeing or catching a Missingno. but everyone agreed they were bad. The tales of corrupted Hall of Fame records and even of the cartridge becoming entirely unusable if Missingno. was caught spread like ghost stories made of wildfire. The game already had a whole mythology of unconfirmed rumors including those about Mew under the truck by the S.S. Anne, secret HM moves, a catchable Yoshi, and a Togepi that could be received after using the item finder on every square in Mt. Moon (confirmed to be false by my friend). With all these rumors circulating and with the item duplication trick already confirmed, it was difficult to know what was true and what wasn't. We didn't even know what this game was capable of and for all I knew, if I caught that Missingno. the game would send out the restless ghost of Cubone's mother to club me in my sleep. Wow. These games. I believe I ordered them from my school's Scholastic book order catalog in 1st or 2nd grade. On the one hand, they were pretty cool; I mean, just look at those 3D graphics. And c'mon. Dinosaurs. But on the other hand these games both had parts that scared the crap out of me so much that all the 3D dinosaurs and bodies in the world wouldn't be enough to convince me to venture into the dark realms of these games again. Both of these games were supposed to be educational and had a small variety of activities relating to their topics. I remember that you could view and explore 3D models of the human skeleton and organs or watch dinosaurs come horrifically to life out of a skeleton. Honestly, I have only a vague memory of what all the buttons correspond to on that 3-D Dinosaur Adventure screenshot, except in one case: the comet in the top right. 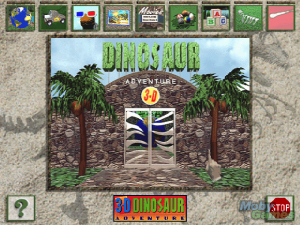 That comet icon started the "Save the Dinosaurs" game, in which you had a limited time to find each dinosaur in a 3D environment. So basically, what it did was throw a helpless young boy into a maze with dinosaurs and told him he had only a few minutes before a comet all but destroyed the world. Sound like fun? It wasn't. Even the short animation and lead-up music to the game freaked me out, maybe because I knew what was coming and already regretted my decision to make another attempt. Sure, there were hints, but when there's a timer counting down to doomsday at the bottom of the screen, stopping to ask for directions probably wouldn't be the first thing on your mind either. Basing a game on the common fear of getting lost probably wasn't the best idea ever for a children's game. Inexplicably, the same company tapped into the exact same childhood fears in 3-D Body Adventure's "Emergency Game". When you start the game a voice tells you to "save the patient! It's up to you!" after which you are able to explore the hospital and select a patient to save, all while "HURRY DOCTOR, SAVE THE PATIENTS!" is displayed across the bottom of the screen. Sure. Alright, no pressure then. Because of that urgent responsibility, I usually dove right into saving a patient, which as you can see in the video (at 3:49) throws you inside their body where you have to shoot viruses or some such. Once again there's a countdown clock and it's confusing to navigate. It wasn't just about me and the dinosaurs any more, there were lives at stake! And once again I was totally lost! But what scared me even more was when I discovered that I didn't have to do these operations and could explore the hospital, albeit still with a sense of urgency hanging over my head. In the video above, the player immediately turned and left the building but when I played I didn't realize that I could exit through that door and explored other rooms instead, getting more and more lost by the minute. Eventually, I found an exit and ended up outside the hospital. In the dark. Lost. And with dying patients. How do they expect to compensate me for all this trauma? !